The best RSS program for macOS and iOS systems will get a new version. Reeder 4 in the edition on macOS can be tested by anyone who is willing. The technology called RSS is a great way to collect information about new entries from selected websites in one place. These types of services draw on one common news list from all sites selected by the user. Thanks to that, you can not miss new posts on your favorite blogs, news from news portals, etc. In the age of social media, RSS's have lost their former glory. However, all types of geeks and ... media employees are still using this type of tools. There is no better way to be up to date with current headlines. 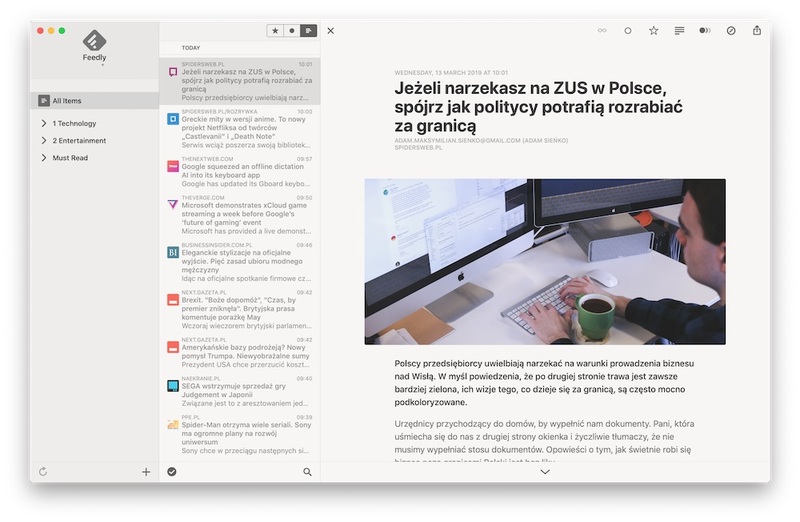 After the death of Google Reader , Feedly was the king of RSS feeds, which allows you to view your list of news in your browser. Added to this are programs that allow you to read the latest news outside the browser. One of them is Reeder , which will soon have a new version. Users of Apple devices who use RSS feeds do not need to present this application. 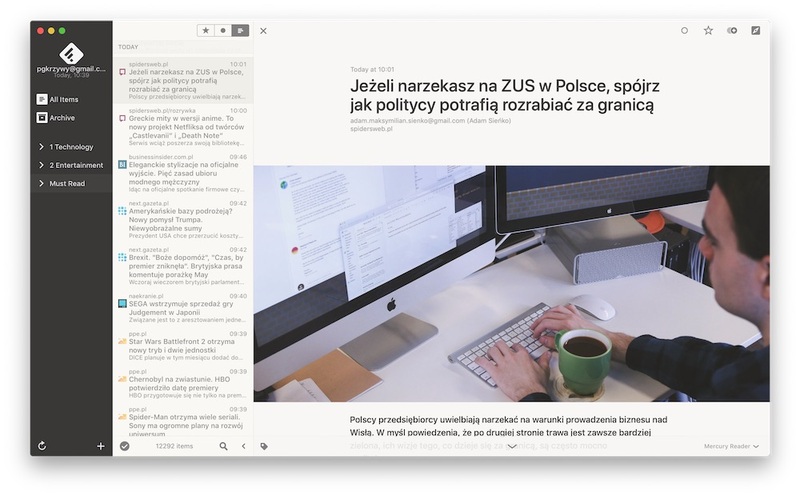 A program that can be an overlay on, among others Feedly, he was awarded in the Mac App Store and is on the honorable 1st place in the News section. Reeder also took 18th place in the same category in the mobile version of the store. Due to the decreasing popularity of RSS technology, I began to worry about the future of the program. Reeder in the mobile version has not been updated a year. Until recently it did not even work properly on the new iPad Pro. The version for computers was last updated, and only for such patching errors, half a year ago. Fortunately, Reeder's creator did not melt in the air. Reeder 3 was not developed, because the developer Silvio Rizzi, as promised, worked on a completely new version of the application. Finally, we saw the effects of these works. Reeder 4 will soon have its premiere, and yesterday debuted the first public beta version for the macOS system. Of course, at the outset, it should be noted that the Reeder 4 beta version is not suitable for everyday use. All functions have not yet been implemented in it. However, it is worth taking a look at him to know what awaits us. The application can be downloaded directly from the beta.reeder.ch website. Reeder 4 was written from scratch and there were some new items in it. One of the most important is the built-in Read Later service, which allows you to store offline articles. Saved entries within it will be synchronized with other devices via iCloud Drive. Users of solutions such as Pocket and Reading List in Safari are not likely to convince you, but such a service will stay together with the reader and will certainly please many recipients. Added to this is the option to draw graphics directly on the list of new articles. There is also a new module for viewing images in full resolution. The application in the appendix automatically changes the layout after changing the window size and colors after turning Dark Mode on or off in macOS. The article view has also been improved. 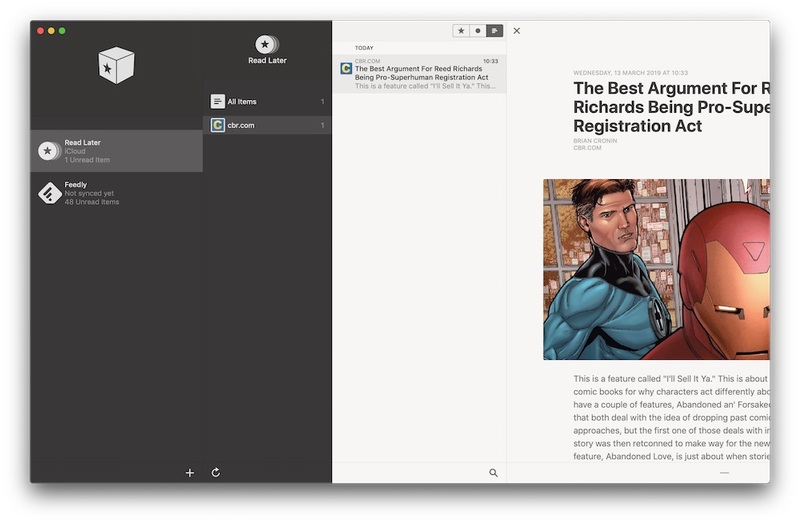 Reeder 4 uses WKWebview and Readability.js. However, I see a few glitches. What irritates me the most is the fact that it is not possible to narrow the source column - it is now more or less twice as wide as in the previous edition. In addition, the Reeder 4 beta does not support navigation using gestures, although I hope it is not a conscious decision, just one of the features that Silvio Rizzi will add later. Either way, I will certainly follow the development of the application. I hope that the shortcomings will be improved and the program will get some new and useful functions. Something must justify the need to pay for the application again, since the previous version still works great, and a few of the changes are not quite what I like. The fact that you will have to pay for the update, of course, does not bother me. Updates have been made available free of charge since the Reeder 3 launch , which took place in 2015 . I can not wait until the Reeder 4 iOS version appears. The developer ensures that he is currently working on this edition. However, I encourage you to download the Reeder 3 application, which you do not have to pay for. The best RSS application is available for free both in iOS and macOS editions.